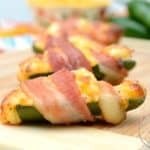 These delicious and simple Bacon Wrapped Chicken Stuffed Jalapeno Poppers are the perfect Keto Party Food! Cut the top off of each Jalapeno pepper, and then slice them in half. Use a spoon to scoop out the insides, including the seeds. Add 1 ounce of canned chicken to a small mixing bowl. Mix in 2 ounces of cream cheese and 1 ounce of shredded cheddar cheese. Sprinkle in pepper to taste if desired. Fill each of the jalapeno pepper halves with the cream cheese and chicken mixture until you have used it all. Cut the slices of thick cut bacon in half lengthwise and then in half again horizontally. This will give you 4 pieces of bacon per strip. Wrap a piece of bacon around each of the stuffed jalapeno peppers. Place the peppers on a baking tray lined with aluminum foil, or on a baking rack that sits within a sheet pan. Bake the peppers for 15-20 minutes or until the bacon is crispy and the peppers are starting to become tender.